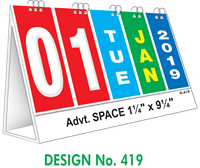 Our selection of practical, and highly useful desk calendars will make a great addition for your desk, your employees’ desks, or any surface in your home. These prints are perfect for individuals or business owners who want to express appreciation and to promote at the same time. calendars are usually given out by business owners just before the New Year begins.